17 traditional Christmas favorites arranged for flute and harp, including "O Holy Night," "What Child is This" and "Gabriel's Message." 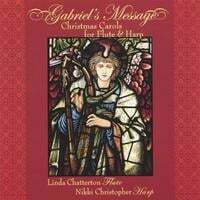 Traditional Christmas carols are paired with premiere recordings of new arrangements by contemporary composers on "Gabriel's Message," a new CD of Christmas music from Minnesota-based flutist Linda Chatterton and harpist Nikki Christopher. The album features sparkling renditions of traditional holiday favorites such as "O Holy Night," "Sussex Carol" and "Lo, How a Rose E'er Blooming" alongside new arrangements, including "The Wassail Song," adapted for flute and harp by David Evan Thomas, "Four Carols of Alfred Burt," arranged by Abbie Betinis, and Stephen Paulus's arrangement of "Gabriel's Message." Flutist Linda Chatterton "ushers listeners into a dreamy world buoyed by smooth melody line and radiant timbre," according to the Minneapolis Star Tribune. A Yamaha Performing Artist, she has toured throughout much of the country as well as in Germany and the United Kingdom. She has performed in New York at Carnegie and Alice Tully Hall, was a featured recitalist on the prestigious Dame Myra Hess series in Chicago, and has been heard on Minnesota and National Public Radio. Nikki Christopher is a Twin Cities-based harpist. She has served as Principal Harp with the Sorg & Whitewater Opera Companies, the award-winning COBRA Ensemble Cincinnati, and currently the Saint Cloud (MN) Symphony. She has performed with the Dale Warland Singers, the Bloomington Symphony, the Northern Symphony, and the Minnesota Opera. A beautiful collection of familiar and not so familiar classical Christmas favorites, a must have for your Christmas season for years to enjoy. I just love this cd. A perfect partnership here.Very special! So glad I bought it this Christmas.